This is Letter No. 31 in Barker numbering. See below for Context and background. A. P. Sinnett Es. F.T.S. c/o J. Herbert Stacks Esq. 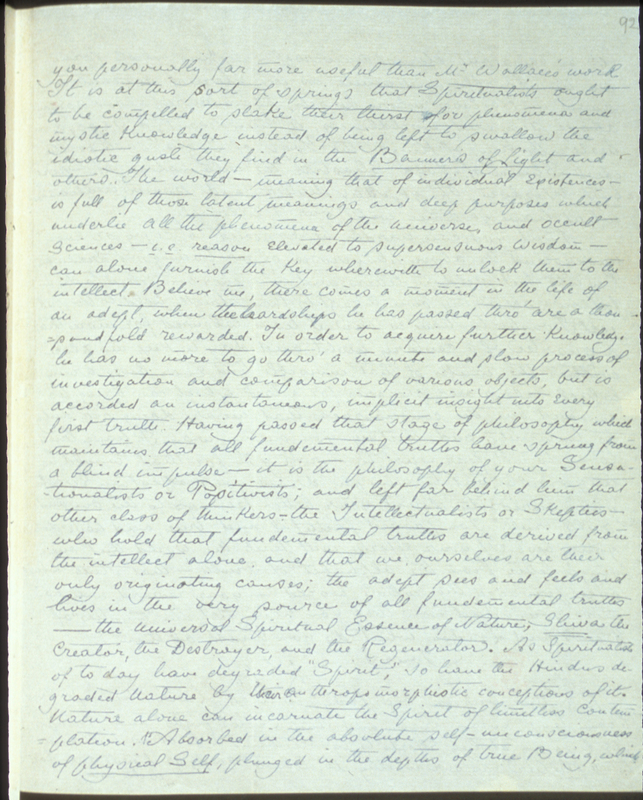 Barker underscored the word "England" twice in pencil and added the letter number XXXI. Numbers 304 and 90 are penciled at the right. The stamp is from France, saying "Republique Française" with a postmark above it saying "Loire". Another postmark above it refers to "Nante". A red "PAID" postmark from London has the date "26 Ma 81". British Museum marking stamped in red. 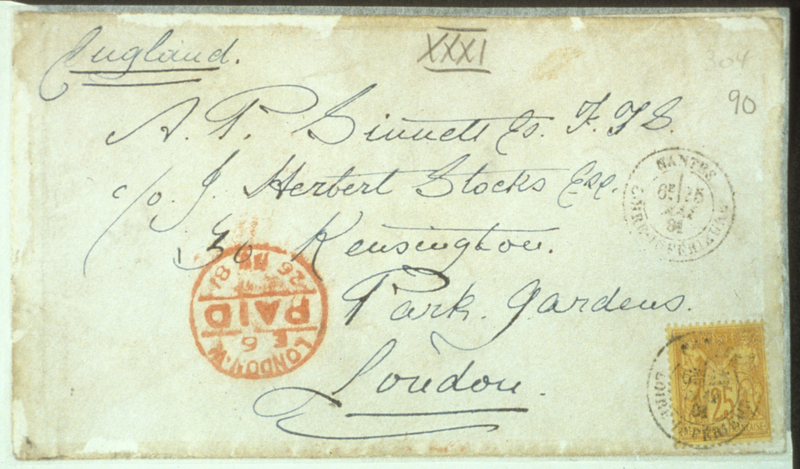 London W postmark for March 26, 1881. Received London, March 26th, 1881. It is from the depths of an unknown valley, amid the steep crags and glaciers of Terich-Mir — a vale never trodden by European foot since the day its parent mount was itself breathed out from within our Mother Earth's bosom — that your friend sends you these lines. For, it is there K.H. received your "Affectionate homages," and there he intends passing his "summer vacations." A letter "from the abodes of eternal snow and purity" sent to and received — "At the abodes of vice"! . . .
Queer, n'est-ce pas? Would, or rather could I be with you at those "abodes"? No; but I was at several different times, elsewhere, though neither in "astral" nor in any other tangible form, but simply in thought. Does not satisfy you? Well, well, you know the limitations I am subjected to in your case, and you must have patience. Terich-Mir (alternatively Tirich Mir, Terichmir and Turch Mir) is the highest mountain in the Hindu Kush region located what today is Pakistan. It has an elevation of 25,289 ft (7,708 m). The first recorded climbing was in 1950. "n'est-ce pas" is French for "is it not?" "Your future book" refers to Mr. Sinnett's book The Occult World. "Mr. Wallace's work": Probably refers to Alfred Russel Wallace's book Miracles and Modern Spiritualism, first published in 1874. The Banner of Light was a Spiritualist newspaper founded by Luther Colby of Boston in 1857. The weekly newspaper proclaimed itself to be an “exponent of Spiritual philosophy of the 19th century,” and had the largest and longest circulation of any Spiritualist newspaper in the world. It ceased publication after 1910.
is no being but eternal, universal Life," his whole form as immoveable and white as the eternal summits of snow in Kailasa where he sits, above care, above sorrow, above sin and worldliness, a mendicant, a sage, a healer, the King of Kings, the Yogi of Yogis," such is the ideal Shiva of Yoga Shastras the culmination of Spiritual Wisdom. . . . Oh, ye Max Mullers and Monier Williamses, what have ye done with our Philosophy! But you can hardly be expected to enjoy or even understand the above phanerosis of our teachings. Pardon me. I write but seldom letters; and whenever compelled to do so follow rather my own thoughts than strictly hold to the subject I ought to have in view. I have laboured for more than a quarter of a century night and day to keep my place within the ranks of that invisible but ever busy army which labours and prepares for a task which can bring no reward but the consciousness that we are doing our duty to humanity; and, meeting you on my way I have tried to — do not fear, — not to enroll you, for that would be impossible, but to simply draw your attention, excite your curiosity if not your better feelings to the one and only truth. You proved faithful and true, and have done your best. If your efforts will teach the world but one single letter from the alphabet of Truth — that Truth which once pervaded the whole world — your reward will not miss you. And now that you have met the "mystics" of Paris and London what do you think of them? . . .
P.S. — Our hapless "Old Lady" is sick. Liver, kidneys, head, brain, legs, every organ and limb shows fight and snaps its fingers at her efforts to ignore them. One of us will have to "fix her" as our worthy Mr. Olcott says, or it will fare bad with her. Kailasa: Mount Kailash, is a peak in the Transhimalaya mountain range in Tibet. It is considered a sacred place in Bön, Buddhism, Hinduism, and Jainism. In Hinduism, it is considered to be the abode of Lord Shiva and a place of eternal bliss. Max Muller and Monier Williams were orientalists regarded among the founders of the western academic field of Indian studies. 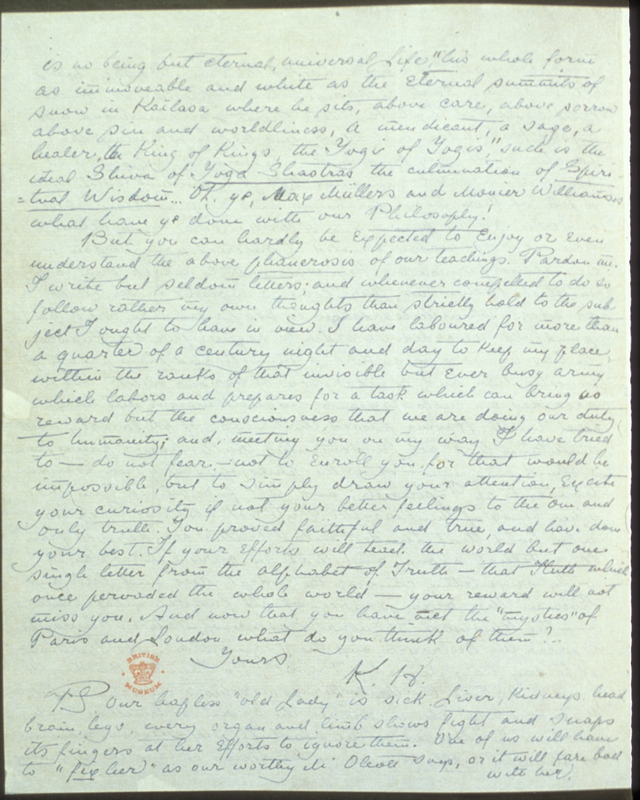 This appears to be the only letter received by A. P. Sinnett from the Mahatma while he was in England. 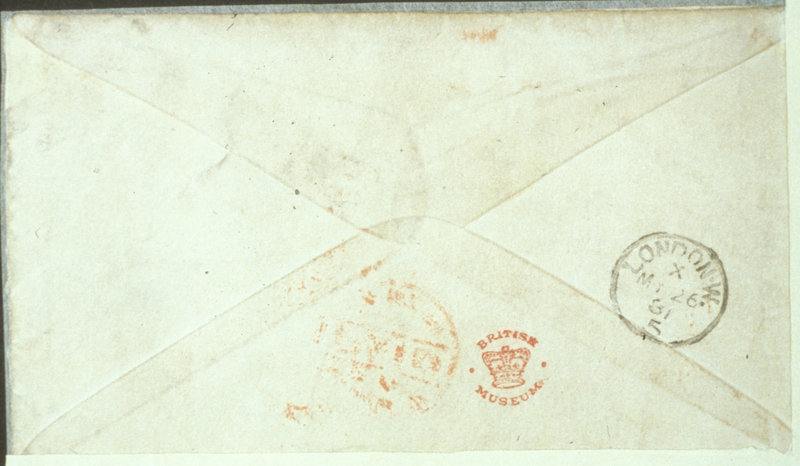 The envelope in which it was enclosed is with the original letter in the British museum. Geoffrey A. Barborka suggests that the Mahatma composed the letter and transmitted it from Terich-Mir, where he was at the time, to an adept member of the Fraternity somewhere in France. This adept then, Mr. Barborka believes, put it in an envelope to which he affixed a French postage stamp and mailed it by regular post. Another possibility is that it was transmitted telepathically to a chela living in France, who wrote it out and posted it to Sinnett. In blue ink on two sheets of white paper, both sides, in fine lettering. The transmittal envelope is in the British Museum Folio. 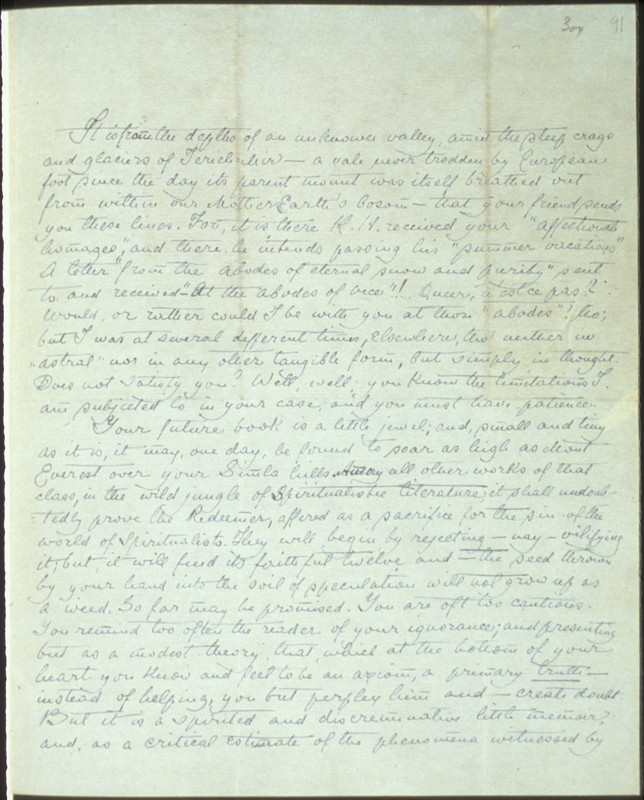 It is addressed to "A. P. Sinnett, Es. F. T. S., c/o Herbert Stacks, 30 Kensington Park Gardens, London." There is a 35c French postage stamp affixed to the lower right-hand corner of the envelope. The script on the envelope is entirely different from that of the letter. J. Herbert Stack was a member of the Society for Psychical Research. ↑ George E. Linton and Virginia Hanson, eds., Readers Guide to The Mahatma Letters to A. P. Sinnett (Adyar, Chennai, India: Theosophical Publishing House, 1972), 58. ↑ "List of Members and Associates," SPR Proceedings, (December 1884), 317. Available at International Association for the Preservation of Occult and Spiritualist Periodicals. This page was last edited on 17 December 2018, at 20:21.